Equivocal pressures towards the new Palestinian leaders may instead confuse the logical and geopolitical premises of facts around the existence of the Israel state. In the same factual fashion, a Hama majority elected government does exist in Palestine, regardless anyone’s wishes of regarding that truth as unreal. In the aftermath of Hamas victory in the Palestinian elections have EU and other Western sectors of interest put forward a main threat to the new elected Palestinian leaders than can sumarizes as: “Do recognize the existence of the Israel state now, otherwise we shall stop the economic aid to Palestine”. The Swedish government seems to rapidly have endorsed that formulation. It is beyond doubt that the intention of the threat is just to get the new leaders on the course of a peace-policy under terms serving EU interest in the region. So be it, that is what international politics is about. But the argument is indeed utterly absurd - and even if unintentionally- nontheless insulting, and risky. The money related argument should be immediately eradicated from the above formulations. 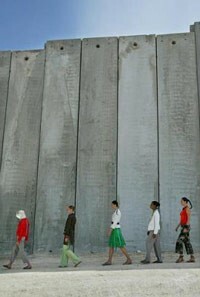 The one and only argument it should be that the existence of the Israel state has to be recognized because their habitants do have the human right to exist as the nation they are, exactly in the same way that the habitants of a Palestinian state have, or for that part the Swedish people does. EU can not possibly “buy” the formal recognition of Israel from a political movement which have made its political advances in Palestine through, among other, their critic of the alleged corruption and penny-related orientation in some decisions about state business in Palestine. In the second place, EU and the countries there belong did not decided to grant this aid to a certain government in Palestine, but to all Palestinians and for helping covering their needs of development of their institutions towards the secure of minimal wellbeing for all. In the third place, this aid has been so fundamentally necessary due to the embargo and the economic/political blockage imposed by the Israel government and which affects the entirely Palestine population. 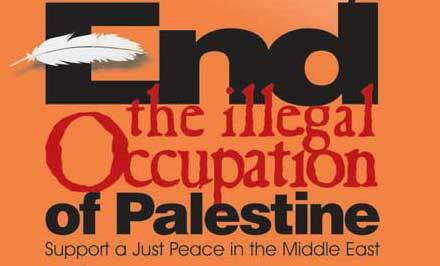 If EU or USA does not wish to spend their money in Palestine, they should instead put pressure on Israel towards a lift of such draconian measures that the ocupation of Palestine territories have signified for ordinary Palestinian's lives, irrespectively of political militancy. Strictly, frontiers in this world are an accident of civilization's wrong development. 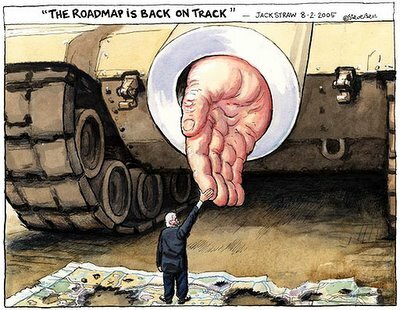 Support the continuation of fair peace talks in the Middle East! 1. Israels rätt att existera - och leva i fred - måste erkännas av palestinierna och alla andra grannar. 2. Dödandet av oskyldiga människor genom självmordsattacker och andra våldshandlingar måste upphöra. 3. Palestinierna måste få leva i fred och värdighet, permanenta israeliska bosättningar på deras mark är ett stort hinder för att uppnå detta mål”. 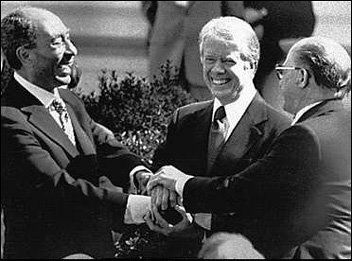 In the picture Jimmy Carter together with Nobel Peace laureates Anwar Sadat and Menachem Begin, after signing a peace treaty between Egypt and Israel in 1979.